This article is about the American Billboard Hot 100 chart held during the 1980s. The Billboard Hot 100 chart is the main song chart of the American music industry and is updated every week by the Billboard magazine. During the 1980s the chart was based collectively on each single's weekly physical sales figures and airplay on American radio stations. 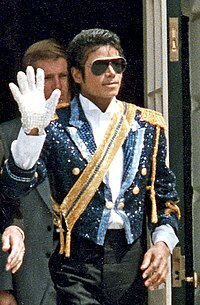 Michael Jackson had the highest number of top hits at the Billboard Hot 100 chart during the 1980s (9 songs) in addition, Jackson remained the longest at the top of the Billboard Hot 100 chart during the 1980s (27 weeks). George Michael was one of the most successful artists of the Billboard Hot 100 during the 1980s, with five number-one singles as a solo artist, three with Wham! and one as a duet with Aretha Franklin. In total George Michael remained at the top of the Billboard Hot 100 chart for 21 weeks during the decade. Olivia Newton-John's song "Physical", was the song which remained the longest at the top of the Billboard Hot 100 chart during the 1980s (10 weeks). 480 January 5, 1980 KC & The Sunshine Band "Please Don't Go"
481 January 19, 1980 Michael Jackson "Rock with You"
482 February 16, 1980 Captain & Tennille "Do That to Me One More Time"
483 February 23, 1980 Queen "Crazy Little Thing Called Love"
484 March 22, 1980 Pink Floyd "Another Brick in the Wall"
485 April 19, 1980 Blondie "Call Me"
486 May 31, 1980 Lipps Inc "Funkytown"
487 June 28, 1980 Paul McCartney "Coming Up (Live at Glasgow)"
488 July 19, 1980 Billy Joel "It's Still Rock and Roll to Me"
489 August 2, 1980 Olivia Newton-John "Magic"
490 August 30, 1980 Christopher Cross "Sailing"
491 September 6, 1980 Diana Ross "Upside Down"
492 October 4, 1980 Queen "Another One Bites the Dust"
494 November 15, 1980 Kenny Rogers "Lady"
495 December 27, 1980 John Lennon "(Just Like) Starting Over"
496 January 31, 1981 Blondie "The Tide Is High"
497 February 7, 1981 Kool & the Gang "Celebration"
498 February 21, 1981 Dolly Parton "9 to 5"
499 February 28, 1981 Eddie Rabbitt "I Love a Rainy Night"
500 March 21, 1981 REO Speedwagon "Keep On Loving You"
501 March 28, 1981 Blondie "Rapture"
502 April 11, 1981 Daryl Hall and John Oates "Kiss on My List"
503 May 2, 1981 Sheena Easton "Morning Train (Nine to Five)"
Do You Want to Know a Secret / We Can Work It Out / I Should Have Known Better / Nowhere Man / You're Going to Lose That Girl / Stars on 45"
506 July 25, 1981 Air Supply "The One That You Love"
507 August 1, 1981 Rick Springfield "Jessie's Girl"
508 August 15, 1981 Diana Ross and Lionel Richie "Endless Love"
509 October 17, 1981 Christopher Cross "Arthur's Theme (Best That You Can Do)"
510 November 7, 1981 Daryl Hall and John Oates "Private Eyes"
511 November 21, 1981 Olivia Newton-John "Physical"
512 January 30, 1982 Daryl Hall and John Oates "I Can't Go for That (No Can Do)"
513 February 6, 1982 The J. Geils Band "Centerfold"
514 March 20, 1982 Joan Jett and the Blackhearts "I Love Rock 'n' Roll"
515 May 8, 1982 Vangelis "Chariots of Fire"
516 May 15, 1982 Paul McCartney and Stevie Wonder "Ebony and Ivory"
517 July 3, 1982 The Human League "Don't You Want Me"
518 July 24, 1982 Survivor "Eye of the Tiger"
519 September 4, 1982 Steve Miller Band "Abracadabra"
520 September 18, 1982 Chicago "Hard to Say I'm Sorry"
521 October 2, 1982 John Cougar "Jack and Diane"
522 October 30, 1982 Men at Work "Who Can It Be Now"
523 November 6, 1982 Joe Cocker and Jennifer Warnes "Up Where We Belong"
524 November 27, 1982 Lionel Richie "Truly"
526 December 18, 1982 Daryl Hall and John Oates "Maneater"
527 January 15, 1983 Men at Work "Down Under"
528 February 5, 1983 Toto "Africa"
529 February 19, 1983 Patti Austin and James Ingram "Baby, Come to Me"
530 March 5, 1983 Michael Jackson "Billie Jean"
531 April 23, 1983 Dexys Midnight Runners "Come On Eileen"
532 April 30, 1983 Michael Jackson "Beat It"
533 May 21, 1983 David Bowie "Let's Dance"
534 May 28, 1983 Irene Cara "Flashdance... What a Feeling"
536 September 3, 1983 Eurythmics "Sweet Dreams (Are Made of This)"
537 September 10, 1983 Michael Sembello "Maniac"
538 September 24, 1983 Billy Joel "Tell Her About It"
539 October 1, 1983 Bonnie Tyler "Total Eclipse of the Heart"
540 October 29, 1983 Kenny Rogers with Dolly Parton "Islands in the Stream"
541 November 12, 1983 Lionel Richie "All Night Long (All Night)"
542 December 10, 1983 Paul McCartney and Michael Jackson "Say, Say, Say"
543 January 21, 1984 Yes "Owner of a Lonely Heart"
544 February 4, 1984 Culture Club "Karma Chameleon"
545 February 25, 1984 Van Halen "Jump"
546 March 31, 1984 Kenny Loggins "Footloose"
547 April 21, 1984 Phil Collins "Against All Odds (Take a Look at Me Now)"
548 May 12, 1984 Lionel Richie "Hello"
549 May 26, 1984 Deniece Williams "Let's Hear It for the Boy"
550 June 9, 1984 Cyndi Lauper "Time After Time"
551 June 23, 1984 Duran Duran "The Reflex"
553 August 11, 1984 Ray Parker, Jr. "Ghostbusters"
554 September 1, 1984 Tina Turner "What's Love Got to Do with It"
555 September 22, 1984 John Waite "Missing You"
556 September 29, 1984 Prince and the Revolution "Let's Go Crazy"
557 October 13, 1984 Stevie Wonder "I Just Called to Say I Love You"
558 November 3, 1984 Billy Ocean "Caribbean Queen (No More Love on the Run)"
559 November 17, 1984 Wham! "Wake Me Up Before You Go-Go"
560 December 8, 1984 Daryl Hall and John Oates "Out of Touch"
561 December 22, 1984 Madonna "Like a Virgin"
562 February 2, 1985 Foreigner "I Want to Know What Love Is"
564 March 9, 1985 REO Speedwagon "Can't Fight This Feeling"
565 March 30, 1985 Phil Collins "One More Night"
566 April 13, 1985 USA for Africa "We Are the World"
567 May 11, 1985 Madonna "Crazy for You"
568 May 18, 1985 Simple Minds "Don't You (Forget About Me)"
569 May 25, 1985 Wham! "Everything She Wants"
570 June 8, 1985 Tears for Fears "Everybody Wants to Rule the World"
571 June 22, 1985 Bryan Adams "Heaven"
572 July 6, 1985 Phil Collins "Sussudio"
573 July 13, 1985 Duran Duran "A View to a Kill"
574 July 27, 1985 Paul Young "Everytime You Go Away"
575 August 3, 1985 Tears for Fears "Shout"
576 August 24, 1985 Huey Lewis and the News "The Power of Love"
577 September 7, 1985 John Parr "St. Elmo's Fire (Man in Motion)"
578 September 21, 1985 Dire Straits "Money for Nothing"
579 October 12, 1985 Ready for the World "Oh Sheila"
580 October 19, 1985 a-ha "Take On Me"
581 October 26, 1985 Whitney Houston "Saving All My Love for You"
582 November 2, 1985 Stevie Wonder "Part-Time Lover"
583 November 9, 1985 Jan Hammer "Miami Vice Theme"
584 November 16, 1985 Starship "We Built This City"
585 November 30, 1985 Phil Collins and Marilyn Martin "Separate Lives"
586 December 7, 1985 Mr. Mister "Broken Wings"
587 December 21, 1985 Lionel Richie "Say You, Say Me"
589 February 15, 1986 Whitney Houston "How Will I Know"
590 March 1, 1986 Mr. Mister "Kyrie"
591 March 15, 1986 Starship "Sara"
592 March 22, 1986 Heart "These Dreams"
593 March 29, 1986 Falco "Rock Me Amadeus"
594 April 19, 1986 Prince and the Revolution "Kiss"
595 May 3, 1986 Robert Palmer "Addicted to Love"
596 May 10, 1986 Pet Shop Boys "West End Girls"
597 May 17, 1986 Whitney Houston "Greatest Love of All"
598 June 7, 1986 Madonna "Live to Tell"
599 June 14, 1986 Patti LaBelle and Michael McDonald "On My Own"
600 July 5, 1986 Billy Ocean "There'll Be Sad Songs (To Make You Cry)"
601 July 12, 1986 Simply Red "Holding Back the Years"
602 July 19, 1986 Genesis "Invisible Touch"
603 July 26, 1986 Peter Gabriel "Sledgehammer"
604 August 2, 1986 Peter Cetera "Glory of Love"
605 August 16, 1986 Madonna "Papa Don't Preach"
606 August 30, 1986 Steve Winwood "Higher Love"
607 September 6, 1986 Bananarama "Venus"
608 September 13, 1986 Berlin "Take My Breath Away"
609 September 20, 1986 Huey Lewis and the News "Stuck with You"
610 October 11, 1986 Janet Jackson "When I Think of You"
611 October 25, 1986 Cyndi Lauper "True Colors"
612 November 8, 1986 Boston "Amanda"
613 November 22, 1986 Human League "Human"
614 November 29, 1986 Bon Jovi "You Give Love a Bad Name"
615 December 6, 1986 Peter Cetera and Amy Grant "The Next Time I Fall"
616 December 13, 1986 Bruce Hornsby & the Range "The Way It Is"
618 January 17, 1987 Gregory Abbott "Shake You Down"
619 January 24, 1987 Billy Vera and the Beaters "At This Moment"
620 February 7, 1987 Madonna "Open Your Heart"
621 February 14, 1987 Bon Jovi "Livin' On A Prayer"
622 March 14, 1987 Huey Lewis and the News "Jacob's Ladder"
623 March 21, 1987 Club Nouveau "Lean On Me"
624 April 4, 1987 Starship "Nothing's Gonna Stop Us Now"
625 April 18, 1987 Aretha Franklin and George Michael "I Knew You Were Waiting (for Me)"
626 May 2, 1987 Cutting Crew "(I Just) Died in Your Arms"
628 June 6, 1987 Kim Wilde "You Keep Me Hangin' On"
629 June 13, 1987 Atlantic Starr "Always"
630 June 20, 1987 Lisa Lisa and Cult Jam "Head to Toe"
631 June 27, 1987 Whitney Houston "I Wanna Dance with Somebody (Who Loves Me)"
632 July 11, 1987 Heart "Alone"
633 August 1, 1987 Bob Seger "Shakedown"
634 August 8, 1987 U2 "I Still Haven't Found What I'm Looking For"
635 August 22, 1987 Madonna "Who's That Girl"
636 August 29, 1987 Los Lobos "La Bamba"
637 September 19, 1987 Michael Jackson with Siedah Garrett "I Just Can't Stop Loving You"
638 September 26, 1987 Whitney Houston "Didn't We Almost Have It All"
639 October 10, 1987 Whitesnake "Here I Go Again"
640 October 17, 1987 Lisa Lisa and Cult Jam "Lost in Emotion"
641 October 24, 1987 Michael Jackson "Bad"
642 November 7, 1987 Tiffany "I Think We're Alone Now"
643 November 21, 1987 Billy Idol "Mony Mony"
644 November 28, 1987 Bill Medley and Jennifer Warnes "(I've Had) The Time of My Life"
645 December 5, 1987 Belinda Carlisle "Heaven Is a Place on Earth"
647 January 9, 1988 Whitney Houston "So Emotional"
648 January 16, 1988 George Harrison "Got My Mind Set On You"
649 January 23, 1988 Michael Jackson "The Way You Make Me Feel"
650 January 30, 1988 INXS "Need You Tonight"
651 February 6, 1988 Tiffany "Could've Been"
652 February 20, 1988 Exposé "Seasons Change"
653 February 27, 1988 George Michael "Father Figure"
654 March 12, 1988 Rick Astley "Never Gonna Give You Up"
655 March 26, 1988 Michael Jackson "Man in the Mirror"
656 April 9, 1988 Billy Ocean "Get Outta My Dreams, Get Into My Car"
657 April 23, 1988 Whitney Houston "Where Do Broken Hearts Go"
658 May 7, 1988 Terence Trent D'Arby "Wishing Well"
659 May 14, 1988 Gloria Estefan and Miami Sound Machine "Anything For You"
660 May 28, 1988 George Michael "One More Try"
661 June 18, 1988 Rick Astley "Together Forever"
662 June 25, 1988 Debbie Gibson "Foolish Beat"
663 July 2, 1988 Michael Jackson "Dirty Diana"
664 July 9, 1988 Cheap Trick "The Flame"
665 July 23, 1988 Richard Marx "Hold On to the Nights"
666 July 30, 1988 Steve Winwood "Roll with It"
667 August 27, 1988 George Michael "Monkey"
668 September 10, 1988 Guns N' Roses "Sweet Child O' Mine"
669 September 24, 1988 Bobby McFerrin "Don't Worry, Be Happy"
670 October 8, 1988 Def Leppard "Love Bites"
671 October 15, 1988 UB40 "Red Red Wine"
672 October 22, 1988 Phil Collins "A Groovy Kind of Love"
673 November 5, 1988 The Beach Boys "Kokomo"
674 November 12, 1988 The Escape Club "Wild, Wild West"
675 November 19, 1988 Bon Jovi "Bad Medicine"
676 December 3, 1988 Will to Power "Baby, I Love Your Way / Freebird Medley (Free Baby)"
678 December 24, 1988 Poison "Every Rose Has Its Thorn"
679 January 14, 1989 Bobby Brown "My Prerogative"
680 January 21, 1989 Phil Collins "Two Hearts"
681 February 4, 1989 Sheriff "When I'm with You"
682 February 11, 1989 Paula Abdul "Straight Up"
683 March 4, 1989 Debbie Gibson "Lost In Your Eyes"
684 March 25, 1989 Mike + The Mechanics "The Living Years"
685 April 1, 1989 The Bangles "Eternal Flame"
686 April 8, 1989 Roxette "The Look"
687 April 15, 1989 Fine Young Cannibals "She Drives Me Crazy"
688 April 22, 1989 Madonna "Like a Prayer"
689 May 13, 1989 Bon Jovi "I'll Be There for You"
690 May 20, 1989 Paula Abdul "Forever Your Girl"
691 June 3, 1989 Michael Damian "Rock On"
692 June 10, 1989 Bette Midler "Wind Beneath My Wings"
693 June 17, 1989 New Kids on the Block "I'll Be Loving You (Forever)"
694 June 24, 1989 Richard Marx "Satisfied"
695 July 1, 1989 Milli Vanilli "Baby Don't Forget My Number"
696 July 8, 1989 Fine Young Cannibals "Good Thing"
697 July 15, 1989 Simply Red "If You Don't Know Me By Now"
698 July 22, 1989 Martika "Toy Soldiers"
699 August 5, 1989 Price "Batdance"
700 August 12, 1989 Richard Marx "Right Here Waiting"
701 September 2, 1989 Paula Abdul "Cold Hearted"
702 September 9, 1989 New Kids on the Block "Hangin' Tough"
703 September 16, 1989 Gloria Estefan "Don't Wanna Lose You"
704 September 23, 1989 Milli Vanilli "Girl I'm Gonna Miss You"
705 October 7, 1989 Janet Jackson "Miss You Much"
706 November 4, 1989 Roxette "Listen To Your Heart"
707 November 11, 1989 Bad English "When I See You Smile"
708 November 25, 1989 Milli Vanilli "Blame It on the Rain"
709 December 9, 1989 Billy Joel "We Didn't Start the Fire"
710 December 23, 1989 Phil Collins "Another Day in Paradise"
The following artists achieved four or more number-one hits during the 1980s. The following artists were featured in top of the chart for the highest total number of weeks during the 1980s. The following songs were featured in top of the chart for the highest total number of weeks during the 1980s. This page was last changed on 3 July 2013, at 08:27.